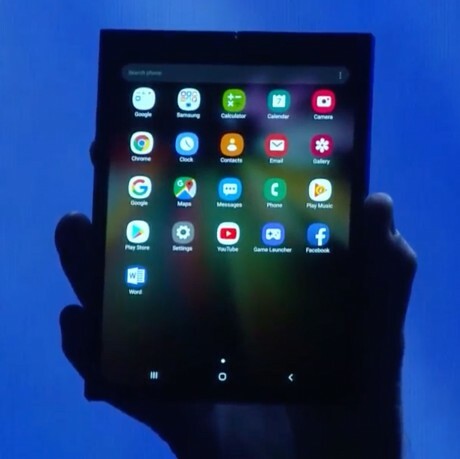 Samsung today showed its folding display technology for the first time. The company had been hinting for several months that it would debut a folding phone. The Infinity Flex Display is what Samsung calls the future of smartphone screens. Samsung used new materials to design the display from scratch. Samsung says the Infinity Flex Display can be unfolded and folded hundreds of thousands of times without degradation. The company created a new adhesive, reduced the thickness of the polarizer by creating a new, thinner material, and made changes to the OLED panel itself to ensure flexibility. The cover display is a fully functioning touchscreen of unspecified size. For a bigger screen experience, users can unfold it to reveal the full 7.3-inch display. Together with One UI, the foldable display relies on continuity so the app on the cover display ports to the inner display fort seamless transitions. It can support up to three apps running in multitasking mode. This is called Multi-Active Windows. Samsung said it should be able to start mass production of the Infinity Flex Display in the coming months. TCL Communication — the company behind Alcatel and BlackBerry phones — is planning to launch one or more foldable phones with a flexible display in 2020, and showed off several of its current concepts at the MWC trade show this week. The company has been actively working on the project for a couple of years already, the result of which is a proprietary, patented hinge design that the company calls DragonHinge. Nubia has a new smartwatch (actually, a full wrist-phone) with a flexible display that wraps all the way around your wrist. The flexible display aspect is actually pretty great, and works well. There's a new touch panel technology in town, and it's coming to next year's phones with flexible displays. Sensel makes touch panels that have the precision and multi-touch capability of today's capacitive touch technology, but are better suited to the flexible displays coming to phones this year and next.